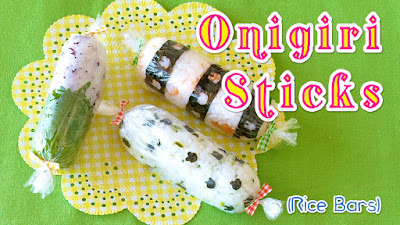 Onigiri Stick is a new type of Onigiri (rice ball) becoming very popular in Japan recently in 2015. You just wrap the rice with plastic wrap and make a bar of rice that you can hold in one hand. Very easy and perfect for parties and Bento! 1. Mix your favorite rice seasoning to the rice. 2. If you like, place Nori seaweed sheet on plastic wrap. 3. Place the rice on the plastic wrap, then wrap and make a thin rice roll.